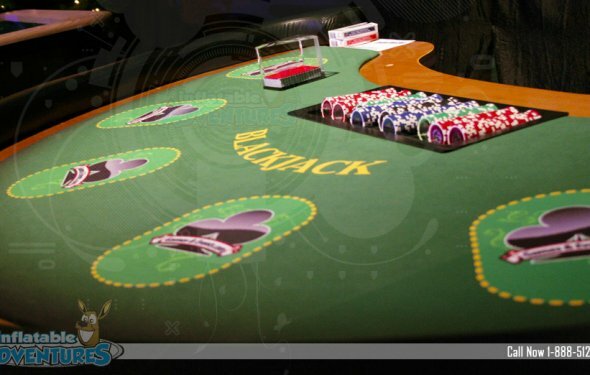 Pontoon is the name of two different forms of blackjack, which can be confusing for players. Australian pontoon is a variant of Spanish 21, so players wanting to learn about that game should read our Spanish 21 article. While Australian pontoon is popular in Australia, New Zealand, India, and Malaysia, the other version of more popular in European and American casinos, and in online casinos. The game most often called “pontoon” gained popularity in England, and can be seen as a British version of blackjack. In British pontoon, the natural 21 isn’t called a “blackjack”, but a “pontoon”. A five-card trick is an important hand in the game. The trick is a five-card hand which doesn’t bust, and this hand pays out at 2:1, making it an exciting proposition any time you have 4 cards and haven’t busted. That’s why Pontoon is so popular, because it offers big rewards at any point in the hand. A player can win the standard payout for a 21, but if that doesn’t hit, an even bigger payout is offered. Learning how to play three-card and four-card hands is important to learning basic strategy, because the enticement of the pontoon payout often causes novice players to take marginal hits. Read and memorize a basic strategy chart before betting on this game, or take a printable chart with you to the casino. Pontoon can be found in a number of different online casino software packages, including Playtech, Microgaming, Cryptologic, Galewind Software, and Realtime Gaming. In most casinos, the deck will contain eight 52-card decks. You can find smaller decks in land-based casinos, but I wouldn’t expect to. On the Internet, Bovada casino’s RTG software supports 2-deck pontoon. The hand ranks are the same as in traditional blackjack. The top hand in Pontoon is a two-card 21, which is called a pontoon. The second best hand is the five-card trick. This is any five cards which do not bust (go over 21). The third best hand will be a non-busted hand of 21 or less, which the highest hand winning. A hand of Pontoon is played similarly to any other hand in twenty-one. The dealer deals out two face-down cards to the player and two cards for the house. One of the dealer’s cards is facedown and the other is face-up. The dealer peaks at their hand. This means the dealer checks to see if he or she has a pontoon. If this is the case, their hand gets overturned immediately and all wagers are paid off. This is an unforgiving rule, but keep in mind you also receive higher payouts in this game.